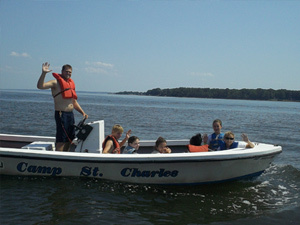 Camp St. Charles is a traditional summer camp offering a wide range of activities and experiences. Our master schedule is designed to schedule each camper team to each activity during their two week adventure. Most activities are assigned twice per two week session. We also have free time periods so that campers may elect to spend more time doing the activities that most interest them. All of our specialized activities are lead by certified instructors. All of our counselors are trained in first aid, CPR and have completed extensive training prior to working with our campers. 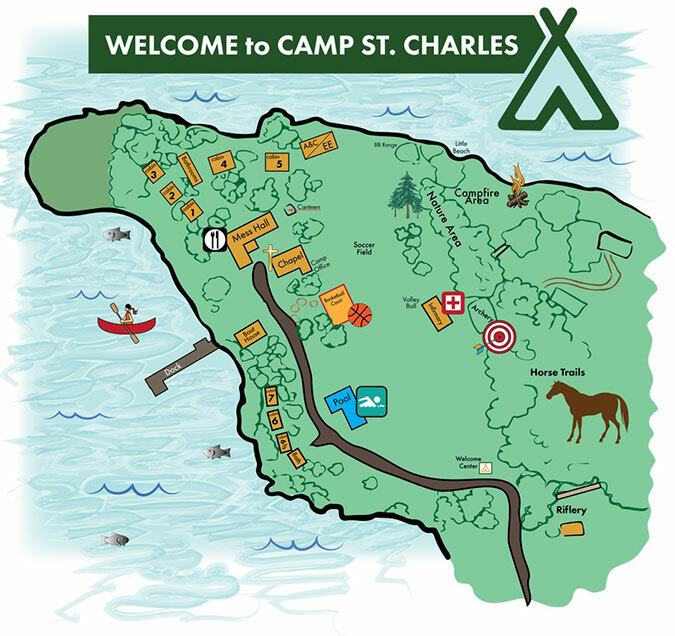 Many of our counselors are former Camp St. Charles campers. All staff members have a criminal background check. Stand Up Paddle Boarding is a new addition to our program. Starting in 2014, campers have enjoyed exploring the Charleston Creek on Stand Up Paddle Boards! 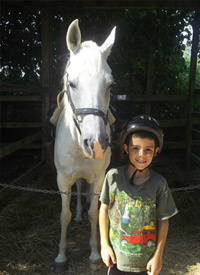 Horseback Riding: Our campers participate in Western style trail riding. Older campers may volunteer to spend additional time grooming and caring for our group of gentle horses. 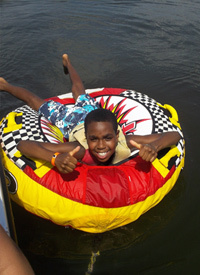 Tubing and Speedboat rides: Campers will be scheduled for a speedboat ride and a tubing experience. Tubing is known at hydro at Camp St. Charles. Swimming: We conduct American Red Cross Swimming lessons and provide recreational swimming time. 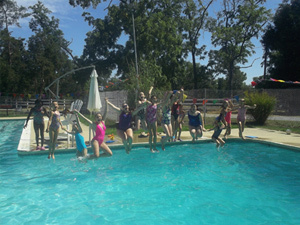 Campers who complete the required skill will be issued a Red Cross Swim Level certificate. 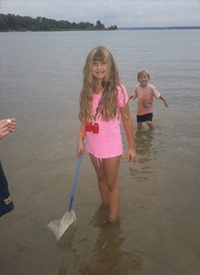 Environmental Education: Campers explore the river and the animals that depend on it through a variety of hands on activities including river seining, bird watching, nature walks and more. 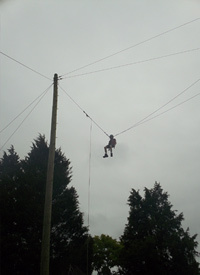 Giant Swing: We have a high ropes experience called the Giant Swing. Campers decide how high to fly as their peers pull them high in the air. When it’s time to fly, the camper pulls the pin for a thrilling free fall and swing. 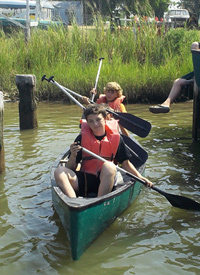 Canoeing: Our campers are introduced to canoeing and learn more complex skills as they improve. Sports: Our campers participate in a variety of team sports. Our emphasis is on team work and we ask all campers to participate. We play soccer, volleyball, flag football, tetherball, basketball, hockey, softball, kickball, rugby and more. 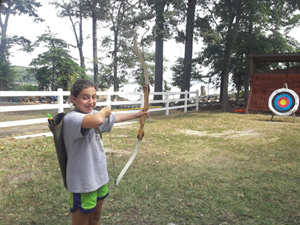 Arts and Crafts: We create a wide range of arts and crafts projects at Camp St. Charles. Campers may select a painting project, rainbow loom creation, recycled art and many other creative projects. New for 2016! We are reintroducing ceramics to our arts and crafts program. Our campers will hand build ceramics with us, THIS SUMMER! Thank you to our many donors who supported our efforts to bring ceramics back to CSC! Campfires: We celebrate the beginning of a new session with an opening campfire event to welcome everyone to CSC. At the end of each two week session, we have a closing campfire that is full of awards, skits, songs and other entertainment provided by the staff and campers..
Ropes Course: We have a low ropes course, also known as a challenge course. This activity focuses on team building and overcoming fears. Camping: 6-9 year olds spend a day camping on Skull Island. 10-11 year olds spend the night. The skull island primitive campsite is located directly across the river from Camp St. Charles. We travel by row boat to the island. King’s Dominion: 12-13 year old campers will take a day trip to King’s Dominion. Park entrance, bus fees, a “major” tee shirt and even spending money for the day are included in the “Major” camper fees. Mentor Program: Campers who have attended Camp St. Charles may continue beyond age 13 if they are accepted into the mentor program. Prospective mentors complete an application and provide personal references. If selected, they work with younger campers and attend meetings to gain skills in leadership and caring for others.